Chondromalacia (of Greek origin meaning “softening of the cartilage”) is a degenerative cartilage condition wherein the cartilage on the back of the patella (knee cap) is irritated and painful because it rubs against the medial femoral condyle. Patients complain of dull, aching pain leading to sharp localized pain in the front of the knee, particularly while going up or down stairs and hills. They may feel a grinding sensation and stiffness when squatting, bending and climbing stairs. The patient may experience the sensation of the knee “giving away” beneath them. During normal walking, the femur (thigh) and the tibia (lower leg) rotate in unison. An abnormal walking pattern (over-pronation) may cause the thigh and lower leg to rotate out of sync causing misalignment of the lower extremity. The resulting counter rotation of the femur and the tibia causes the patella to rub against the medial femoral condyle instead of moving smoothly up and down in its normal track, causing pain and damage to the cartilage, leading to chondromalacia. Note: The saddle-shaped superior surface of the talus bears the weight of the body transmitted via the tibia. 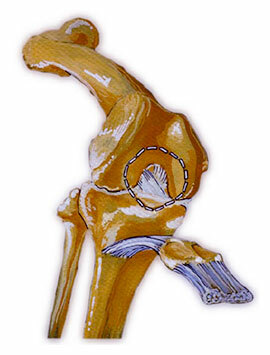 Hence, over-pronation may result in the tibia internally rotating beyond the end of contact phase while the femur begins rotating externally at mid-stance. Treatment options vary according to symptoms and the severity of the injury. The patient may respond well to quadriceps strengthening exercises and a hamstring flexibility program. Actions such as crouching, knee bends and resistance exercises with knee extension from a fully flexed position should be avoided. Most importantly, proper alignment of the patella must be maintained. Once over-pronation has been arrested, and alignment regained, healing can begin. The patient should be fitted with orthotics and will likely experience pain relief within weeks and complete recovery within months (generally 2 – 3 months).